When I want to take a trip, I book a ticket, pack a bag (a small one at that) and go. And then I look at my friends with children and watch in awe at the planning, packing, cajoling, refereeing and excitement containing that goes on when they, likewise, take a trip. And that’s not to mention the bags – usually enough of them to fill a car all by themselves. Every time I’m intrigued by the details of what family travel looks like…but every time I’m too nervous to ask – I just imagine it’s an idyllic journey with happy, giggling children and not stick jam hand or embarrassing moment in existence. And for a long while I wanted to retain that image. But now I have the truth! In this guest post Kimberly of the wonderful blog Carper Diem Carry On shares with us the highs and lows of travelling with her husband and two children on a 4.5 month trip across Europe. Most impressive of all – they’re doing it with carry-on. Spouse of 1, Mom of 2, HR consultant and Adjunct Faculty member. Caught up in the trend of doing too much and forgetting to enjoy the little moments. Committed to changing it up a bit by spending 4.5 months as a family traveling Europe. A bit terrified of committing to a carry on, a backpack and two pairs of shoes. Hoping to return from this adventure stronger, healthier and with a broader family view of the world. 27 hotels and B&Bs, 5 homestays, 2 youth hostels, 1 house rental, 8 flights, 4 car rentals, 1 car lease, countless trains. 1 spouse and 2 kids. As we planned this trip, people constantly told me we were crazy. I heard things like “How do you plan all that?” Or, “Can you really take the kids out of school that long?” Supposed friends even asked questions such as, “The kids are young; do you really think they’ll remember any of it?” Considering what we’re spending on this trip, they had better remember it. But honestly, those aren’t the questions I asked myself. Don’t get me wrong. I love my kids. A lot. But I am not one of those people who does the Mom thing naturally. And I admit that I get jealous of my amazing friends who do. I look at Facebook and see the gifts they are making for the teachers at the end of the school year, but I end up going with gift cards. I see the posts of the elaborate cakes they made for birthday parties, but I breathe a sigh of relief when my son decides he wants donuts from the grocery store for “something different”. Although, if I attempted to make some of the things I would love to try on Pinterest, he would get “something different” indeed. Bottom line is – I’m realistic. I wasn’t harboring any fantasies that we were going to jet off to Europe and glide through countries acting like the Cleavers from Leave It to Beaver. I wasn’t fooling myself into thinking that being in a room with a 7-year-old, 9-year-old and 44-year-old was going to be a barrel of laughs all the time. I figured there would be the good, along with the bad, and my hope was (and is) that we’d come out on top. So I headed into this with a practical, albeit slightly skeptical, eye. Now, 3.5 months into the adventure, I’m learning that traveling this long with kids has some pretty trying moments, and it has absolutely wonderful moments as well. 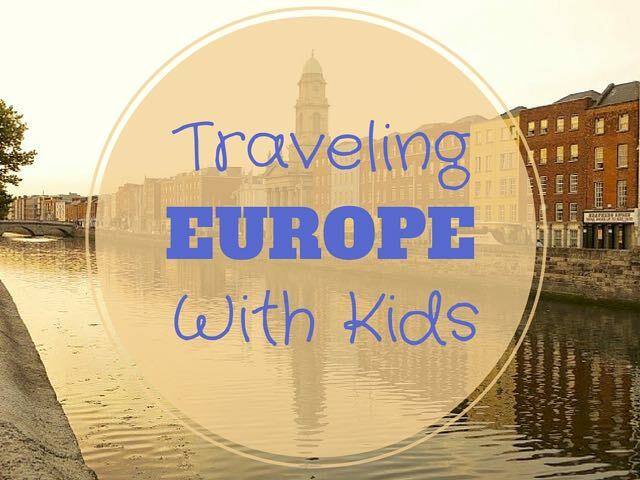 What’s it really like traveling through Europe with kids? So, let’s start with what has been unexpected, but pretty cool about traveling with the kids in Europe. As my husband puts it, the kids are amazing icebreakers. They’re like that coffee table book that draws you to it and gets the conversation started. We have had more people strike up conversations with us because of the kids, and that has made strolls, shopping, and sights all that much more fun. 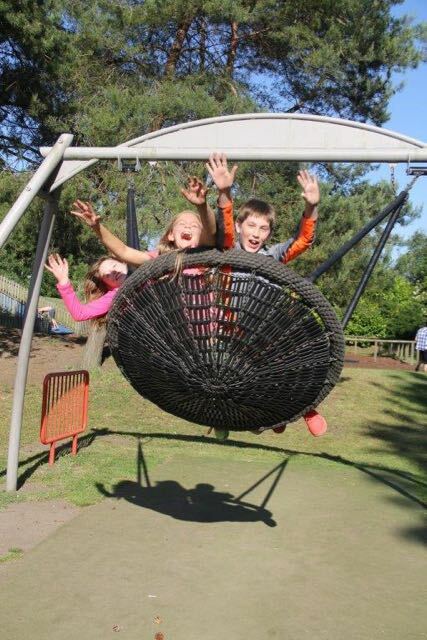 The kids have made friends with other kids which have led to joint trips to playgrounds…and what amazing playgrounds we have found! We need one of these near our house! However, I think we can take a break before trying one of these again. Which is worse…the fact that this happened, or the fact that my husband got a picture of it? The kids make us think about things differently and search out activities we would never do if it were just the two of us. Having the kids with us, we focus on accentuating the positive. We choose our words more carefully, and we don’t gripe about things that might normally get to us because we don’t want the kids to hear it. And, frankly, we don’t want to hear them complaining either. Case in point – we do a family toast at most meals. It’s a nice way to accentuate the positive. At least that was the plan. We quickly learned that we had to put a few parameters around it. Toasts are positive. Period. And things such as, “I am toasting to the fact that my sister wasn’t a complete jerk today,” don’t cut it. We also end up doing things we would never do without the kids. 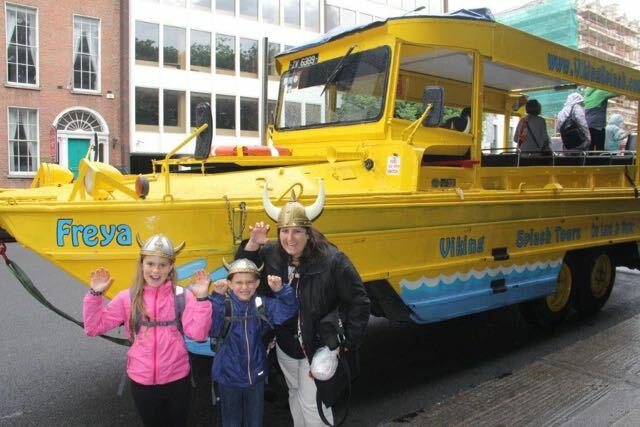 I have to admit that riding through the streets of Dublin on a Viking Splash Tour roaring at the poor, unsuspecting tourists is a heck of a lot of fun. If only we could have kept the hats! Another activity I would have never considered was a ghost tour. 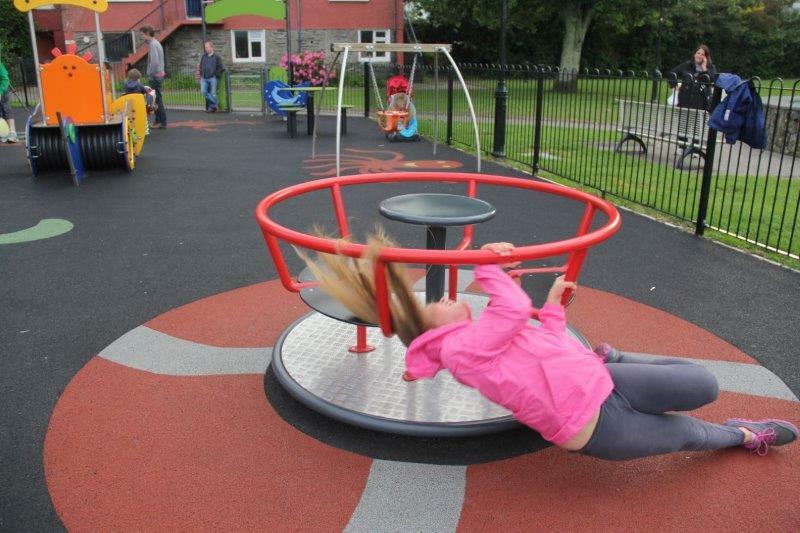 But after Missa B begged to go on one for 5 weeks straight, we caved in Kinsale, Ireland. I know I would not have laughed quite so hard at the guide’s jokes if I didn’t have a giggling 9-year-old having the time of her life next to me. And in France, I guarantee that my husband would not have dressed up as a court jester in pink tights and danced in front of a camera if we didn’t have kids (sorry, but those photos are currently unavailable as I value my marriage). One thing we are finding in all the countries we have visited thus far is that people love to bring kids into the action. It has been a great experience for the kids to be able to participate in activities. And they love it when we get pulled in as well. In Stratford-Upon-Avon, we visited Shakespeare’s birthplace. 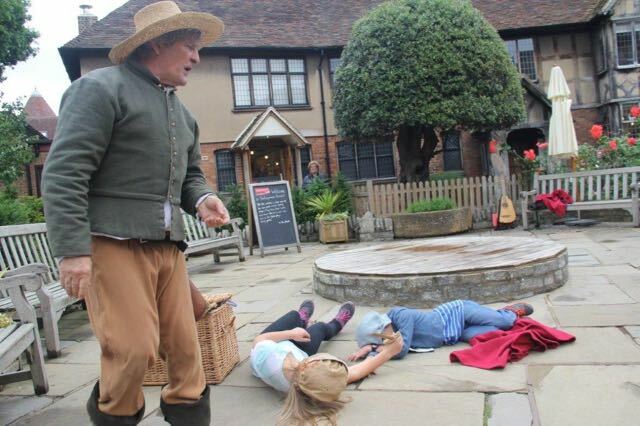 In the courtyard, an actor performed excerpts from Shakespeare’s plays on demand. When our children walked into the courtyard, he immediately asked if they would help him. He got a chest full of clothes and costumed each kiddo. He then had the kids do actions as he performed dialog. The kids really got into it as a crowd formed and cheered for them. And, my husband reluctantly got to be the lion, although since he was taking a lot of photos, he missed a few of his cues. The grand finale: the death scene. A few days later, we visited Mary Arden’s Farm where Shakespeare’s mother lived. We visited the blacksmith, and spent 45 minutes searching for a hay maze only to realize it didn’t open for a month. The highlight of our visit, however, was herding geese. We watched as two women brought a gaggle of geese across the lawn. 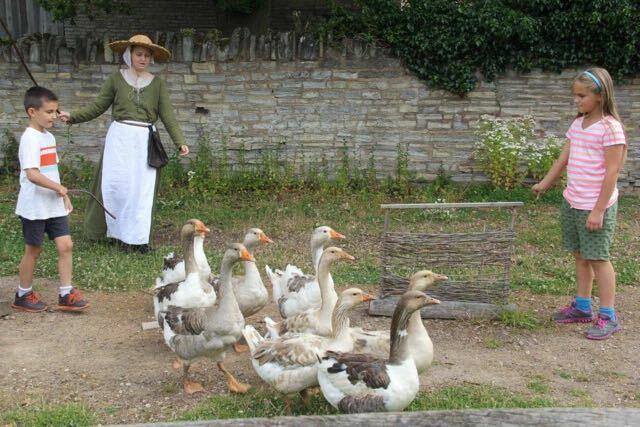 It turns out that hundreds of years ago, they would herd geese over 100 miles to market. Suddenly, the kids were asked to herd the geese, A few tries, and they had it down pat. We were then invited to try as well. It took us a little longer to figure it out, but with the kids’ encouragement, we successfully brought the geese to their feeding area. No photos of us, as our heads got cut off in the photos…a definite hazard of traveling with 4-foot-tall offspring. We’ve had many similar interactive experiences throughout England, Ireland, the Netherlands, Belgium, and France which just would not have happened without Missa B and JJ. This is one I did not see coming. My kids love their beds and bedtime. A little reading time, a song or two sung by Mom, and then they drift off into dreamland. At least that’s what used to happen. Fast forward to this trip. Where not only are they usually sharing a bedroom at least with each other and often with us, but many times they are actually sharing a bed. 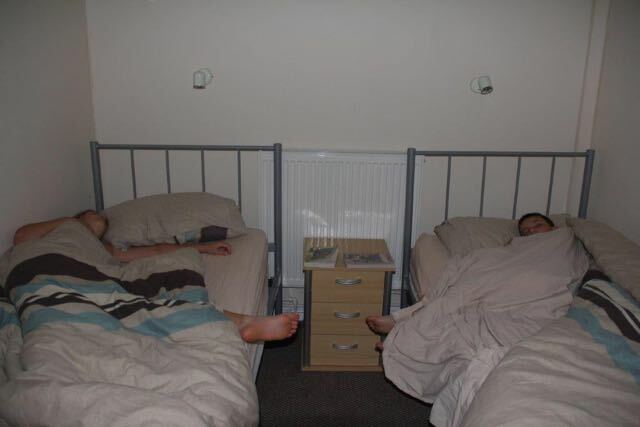 Could you share a bed with someone who sleeps like these two?! The first two weeks were absolute hell. The kids would get crazy hyper at bedtime. They tickled each other, hit each other, pulled down the pillow wall we had built between them, and made whatever noises they could to keep each other (and their very tired parents) awake. After bribes, threats and lots of, as my friend Jenny calls it, “angry Mom voice,” we put our daughter on the floor. When she fell asleep, we made the mistake of putting her back in the bed. They promptly woke each other up, and it started all over again. And completely breaking the bed. Husband, son, and bed all ended up on the floor. Daughter, startled awake, shot straight up in bed with a crazed look trying to figure out what happened. And, we started all over again. Let’s add in the fact that by the time JJ finally did fall asleep, he slept so hard that he never woke up to use the bathroom in the middle of the night. Lots of fun explaining wet sheets to a B&B owner. I am happy to report that my friends, and one friend in particular (thank you, Jesica!) came through for me by suggesting meditation podcasts. Having never done meditation before, this was not even close to being on our radar. But, for the past 102 nights, our kids have fallen asleep clearing their minds and envisioning colors. With a mountain of pillows between them. And a bribe of 1 Euro for each night that they fall asleep without issues. You do what you must to survive. Ranks right up there with bedtimes. Our most classic need-to-pee situation came in Limerick, Ireland when we were heading to the home of a family we didn’t know, but who are friends of my in-laws. We had the address and the GPS or SatNav as they call it there. Turns out that having an address means nothing to a SatNav in Ireland. Why? Because roads often have multiple names. Or are only recognizable by landmarks. Or only have addresses on even-numbered houses. Which are only put up on Tuesdays. OK, that last part might be a slight exaggeration, but it sure feels that way. So we get to where we think the road should be, only it’s called Remington Drive, not Remington Circle. And there is no number (on the few even-numbered houses) that is remotely close to what we need. So we drive around for 15 minutes, finally stopping a woman who kindly points us back to where we had just been. We head back. So we go down a different road. At which point, JJ informs us he needs to pee. We inform him that since we are in a completely residential area, he’s going to need to wait. We stop a man on a bicycle for directions. The Irish are beyond kind, so he pulls out his phone and tries to map it for us. Now Missa B informs us she needs to pee, and JJ lets us know that his situation is desperate. At this point, a woman pulls up in her car, next to the man on the bike, and asks if she can help. She doesn’t know where the road is either, but she pulls up a map on her phone. And the biker now tries to call the family for us. They, of course, don’t answer because that would have been too easy. So, we give up. And, in a very nice residential area, at the end of a dead-end street, we stop the car. IN FRONT OF SOMEONE’S DRIVEWAY. And we let the kids out with the car blocking them from anyone coming down the street. Not one of our proudest moments, but considering that it took us another 45 minutes to find the house, one of the best decisions made on the trip thus far. The kids are missing two months of school. We are fortunate in that the school is incredibly supportive, yet I still brought schoolwork with us. During the month of September, we rented a house in the Loire Valley of France, so the plan was to focus on schoolwork during that month. Then there’s the 5th grader. And math. Need I say more? There have been more fights sitting at the table going over math than at the heavyweight championships. Even the mention of math time brings on whining and complaining. Then we sit down only to have her wail, “I do NOT know how to turn fractions into decimals!” Umm…that’s why I’m teaching it to you. “But you are so NOT a teacher!” Actually, I am, but I guess university students don’t count. Bottom line – this trip will be the end of our experiment in homeschooling. If you need a break, you just can’t get it. One of the biggest challenges we’ve faced is that when we’ve had enough of each other, there is nowhere to go. No room to escape to; no door to slam; most of the time the bathroom door doesn’t even lock. And the shower stalls are so small that you can’t even shave your legs, so taking a long, hot shower to get away just isn’t an option. I never thought I would hear my kid telling me that she misses being sent to her room. But I get it. There are days when the idea of having a room to go to sounds absolutely heavenly. But, it’s a luxury we don’t have, and so we deal with it. Sometimes it’s pretty, and sometimes it’s not. I try and block out the tantrums, fit throwing, and general unpleasantness while saying a short prayer that the people staying nearby are parents as well. Preferably non-judgmental ones. The one thing I never anticipated was sweet, unexpected gestures of kindness directed at the kids. And seeing the joy on our kids’ faces, and on the faces of the givers, when it happens. The first time it happened was at Ironbridge in Telford, England at the plaster shop in Blitz Hill. As we talked with the 83-year-old artisan, Terry, and learned his story, we also admired his work. Missa B was staring at some pieces and looked over at me. Suddenly, Terry wrapped up the piece Missa B was admiring and handed it to her. And then he wrapped up another one for JJ. Both kids were simply blown away, and it touched me to see how happy he was to make their day. And then, Missa B ran back to him to get his address so she could send him postcards from our trip. Two small plaster pieces have resulted in 5 postcards so far that I bet touch Terry (seen below) each time he receives one. 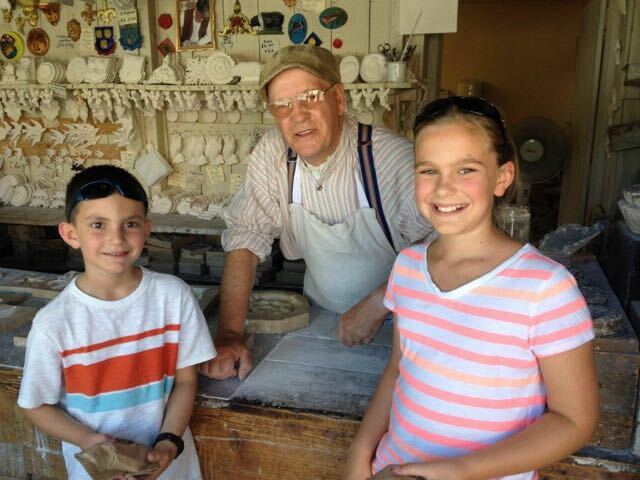 Terry has been making Plaster of Paris pieces for the past 68 years. A few days later, we were picking out postcards in the Iron Museum, and the kids asked to buy candy sticks. We had been talking a bit with the museum shop clerk, and as the kids each brought up a stick of candy, he bellowed, “Special Today ONLY for kids from Washington State…an extra free candy stick each!” A simple gesture that thrilled the kids to pieces. 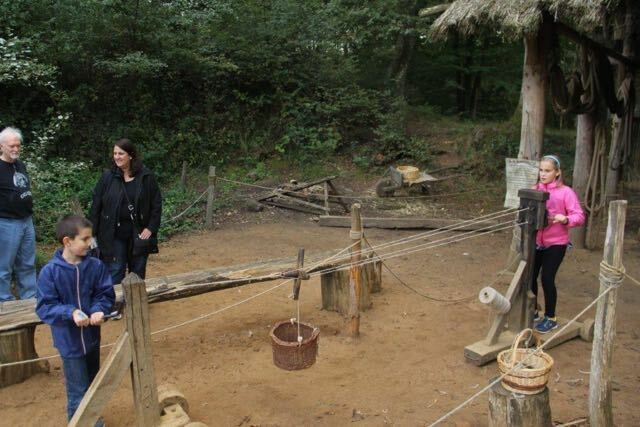 And just last week, we went to Guédelon, an amazing site where a team is building a medieval castle with only tools and methods used in the 13th century. They even build all the tools themselves on site. As we watched the rope maker create rope, he turned to the kids and motioned for them to have a try. When they finished, he slipped some rope he had made out of his pocket and told each of our children to quickly hide it in their pockets so they could take it home with them. The kids felt so special, especially after seeing the same thing for sale in the gift shop for 4 Euros each. I had no idea how to make rope before watching this! It’s fun to see the kids bring out the best in people. Even in us. Which is something I will try and keep in mind the next time we sit down to do math. If you’d like to read more about Kimberly’s family’s (mis)adventures, check out her blog, Carper Diem Cary On. Kids are very notorious outside they get excited every time they see something attractive I’m always insecure about their health while we travel abroad to explore different countries thanks for sharing such informative content. Kids are very notorious outside they get excited every time they see something attractive I’m always insecure about their health while we travel abroad to explore different countries thanks for sharing such an informative content I will surely share this on Whatsapp and Facebook.